Evidence Driven Design (EDD) Strategy: What Is It and Why? 3. Roadmap — Activities needed to build and ship the product. You probably have dealt with stakeholders in the past, sometimes they want you to follow a specific strategy. Nevertheless, it is ok to be skeptical if you don’t share the same vision. If this happens to you, don’t panic! Josh Vincent, Sr. Product Manager at Xero, faced a similar situation and along with his team, they started putting pieces together to build their own strategy. As a final result, they came up with the Evidence Drive Design strategy, inspired in the lean methodology. Evidence Driven Development is an effective product development strategy where decisions are made based on data. In this methodology, a problem is clearly defined in terms of various factors, an EDD score is calculated, and experiments are conducted to validate the data and assumptions being made. Using EDD helps ensure we have conversations around value to build features that have the greatest relative impact. Use data where you have it and identify your assumptions. Measure the return on investment for what you are building. Run experiments to turn assumptions into foundations. Customer: Who is this for? For whom are we creating value? Problem: What is the top problem (or 3) facing this customer segment? 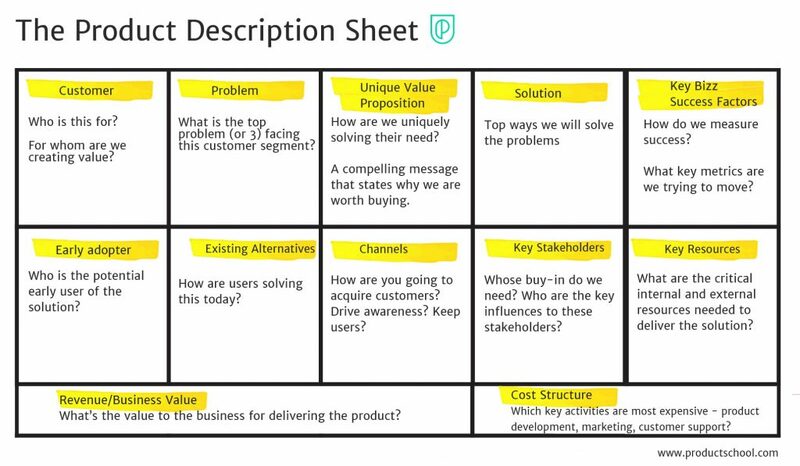 Unique Value Proposition: How are we uniquely solving their need? A compelling message that states why we are worth buying. Key Business Success Metrics (KPIs): How do we measure success? Early adopter: Who is the potential early user of the solution? Existing Alternatives: How are users solving this today? Channels: How are you going to get, keep and grow customers? Get -> How will we drive awareness, usage, interest? Keep users? Keep -> How will we keep customers back? Key Stakeholders: Whose buy-in do we need? Who are the key influences to these stakeholders? Key Resources/Partners: Critical internal and external resources need to deliver the solution. Revenue/Business Value: What’s the value to the business for delivering the product? 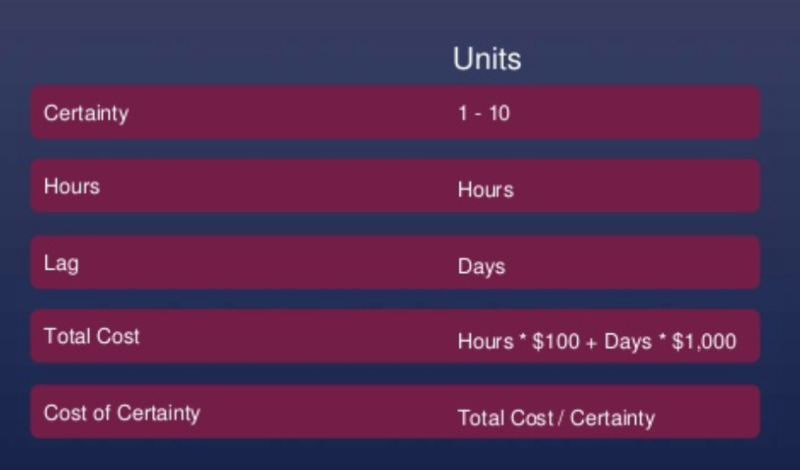 Cost structure: Resources/expenses for building and maintaining the product. Which key activities are most expensive – product development, marketing, customer support? Which key resources are most expensive? 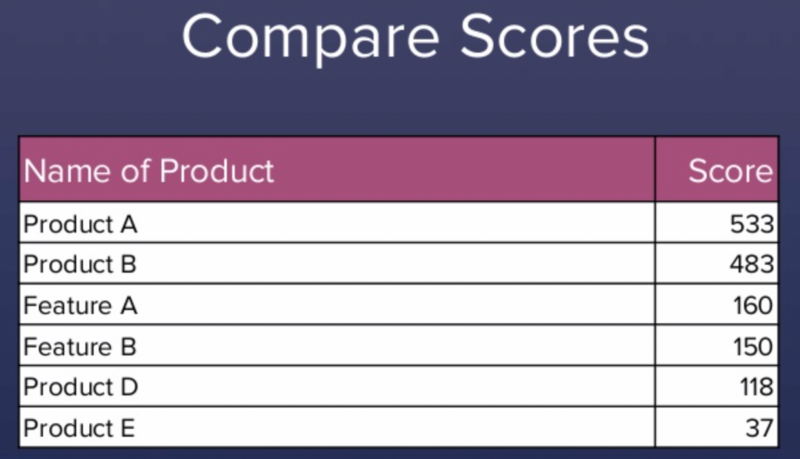 Create an EDD Score Spreadsheet for calculating the ROI of a product. What is an EDD Score? It’s a relative indicator of ROI for a feature/product over the long term in $/effort. The EDD Score relies on assumptions so it is not perfect or precise, it is also used as a metric to compare initiatives side by side. We can see it as a way to prioritize by generating a value that can be used to rank features. Calculating the EDD score doesn’t have to take a lot of time, invest only enough to make the next decision. Very Simple exercise – this takes around 5 minutes where you rate questions on a scale of 1 – 5. For example, are the customers going to be happy with our product? Moderate exercise – this takes around 10 minutes where you make estimates for the impact per user (monthly), Customer Acquisition Cost, Staff needed, Churn Rate, etc. Detailed exercise – this will help you fully comprehend the project compared to other initiatives. Consider the customer growth and apply an attach rate for each year to the user numbers. At the end of this, compare the EDD Scores of all the products. Can you trust the EDD Scores? Keep in mind that these numbers are only as accurate as the fictitious data, ludicrous assumptions and wishful thinking they’re based upon! Turning Your Gut Feel into Data: create a Product Experiment Roadmap to gain confidence in the numbers you have placed in your EDD Score. With the EDD score sheet and product description complete, build your case. Create experiments for each metric. Do the ones with the best yield first. Hypothesis – Target your metrics. For example, users will value and pay for a bookkeeper on demand. Experiment – Create and run experiments; ask 50 customers, bookkeepers, and partners if they would be willing to pay for this service. Results – Document & discuss your findings; results 27 of 50 respondents said they would be willing to pay for online support from a bookkeeper for up to 60 minutes. Conclusions – Confirm/change your assumptions and publish findings; now that we know a realistic attach rate, we can better calculate the ROI on this effort. Experiment → We will <describe experiment> – This is the data that we will gather and how we will analyze it. Observe – Then we will see if <Hypothesis> – Then, we will see if our planned pricing is less expensive. Result → This means … and we can be more / less confident in our critical question – How we will interpret the data if it is what we expect – and this means that customers will pay $1 per for transaction so we can be more confident in our monthly revenue per user critical number. Results – What was the data you generated? Experiment Quality – Did you gain any useful data? Budget – Did it take you as long as you expected? Confidence Increase – Did your confidence go up? How much? Josh Vincent has been building software since his computer science days at University. He is a seasoned Product Manager, Designer, and Entrepreneur. He spent almost a decade shipping products at Microsoft, followed by a few startups in Silicon Valley. Most recently he shipped a major Payment Network for businesses and employee users of Xero. He has driven the shipment of over 20 internationally recognized products, including SaaS platforms, hardware, and software.